In one of my prior books I had a scene where the heroine was attempting to harvest honey in the wild. It was a small scene, but it was pivotal the story. Problem was, I didn’t know anything about gathering honey, not in the present and definitely not in the 1890s which is when my story took place. So off I went to do some research - and what fun research it was! One of the more interesting things I learned (which had nothing to do with the scene in my story) was something of the history of honey bees in America. Today I thought I’d share the highlights of that history with you. There are lots of bees that are native to America, but honey bees are not. The assumption is that they arrived here with the earliest settlers who would have considered them a must-have item not just for the honey they produced and pollination duties they performed, but also for their wax making abilities. The earliest mention of the honeybee’s journey to the New World can be found in shipping records dating back to the 1620s. It would take over 230 years for them to make it to the Pacific coastal states. Those first bees to be transported here arrived in Virginia. Once they got a toehold, however, they began moving further afield by swarming. By 1639 they could be found in neighboring Maryland. By 1655 swarms had established hives in Pennsylvania and Connecticut. By 1820 honeybees could be found as far afield as Michigan, Missouri, Indiana, Wisconsin, Iowa, Illinois, Arkansas, Oklahoma and Texas. Things slowed down for a while, but eventually they made it to Utah courtesy of the Mormon settlers and by 1852 they’d shown up in Nevada. The Rockies proved to be a significant barrier to the migrating swarms. Even with the help of migrating settlers, the trip over the snowy peaks was not an easy one for the bees. One story speaks of a traveler who planned to undertake a trip to Oregon via the Applegate Trail. He was offered $500 if he could successfully deliver a viable hive of honey bees. According to the anecdote, he decided to take two hives with him thinking that way he would surely arrive with enough live bees to make one intact hive. Alas all the bees in both hives perished of cold and disease before he was able to make it to the other side of the mountains. In 1853 an enterprising individual purchased twelve hives in Panama. He then transported them across the Isthmus and sent them on to San Francisco. One sole hive survived the trip but that was all it took. That thrive flourished and as with that original hive in Virginia 220+ years earlier, it went on to spawn a number of swarms. As you can see from this short history the journey of the honeybee across America was very similar to that of the early settlers themselves. They faced some of the same barriers - disease, harsh climates, predators, resource competitors, and geographical roadblocks - that hindered their advance. But the human and apian settlers had a very symbiotic relationship during this westward push. 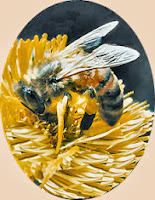 The honey bees not only provided honey and wax for the settlers, they often arrived in advance and helped to spread the white clover and other European grasses that the imported livestock favored. In return, the humans planted countless acres of land with crops that were favorable to honey bee populations, built hives, and more importantly transported them over terrains such as treeless plains and mountain ranges that would have been difficult for the honey bees to cross on their own. How about you folks out there? Do any of you have experience with bees, either in the wild or in a man-made hive? This is fascinating, Winnie. When I was researching the colonies of East and West Florida around the time of the Revolutionary War, I read of William Bartram's travels in those areas. He was surprised to find no honeybees at all in West Florida, but had seen them all the way from East Florida up to Nova Scotia. Here's something we take for granted in everyday life, but early settlers to these shores had to work hard to bring them here. One more thing to be grateful for. Hi Louise - glad you enjoyed the post. And isn't it interesting what we uncover as part of our research! That is a cool story! Who knew? Very cool. Even though I am allergic to bees! I knew about the bees from growing up in MD and exploring colonial Williamsburg. Hi Julie. You have my sympathies on the allergy - I've only been stung a few times but it was a painful experience both times. I can't imagine how it would be if I actually had an allergy to them! I loved learning about the history of honey bees in America! I admit I had never given thought to their origin. I am always fascinated to learn what authors uncover in their research. Thank you so much for sharing this interesting post! Hi Britney - you're quite welcome! And before this research I'd had no idea the honeybees weren't native to this country. I suppose this is one case where introducing a non-native species of insect actually was beneficial rather than harmful! Winnie, Your information about the honey bees was so interesting. Thank you for sharing. Melanie, you're quite welcome - glad you enjoyed the post! I have no experience with honey bees other than enjoying their honey! Love honey! Interesting research and comparing bees to early settlers. My dad got into beekeeping about 15 years or so ago. SO I have learned quite a bit about bees, but never had heard of there history in NA. I will forward your post on to him! Local honey is the best, don't be buying the stuff from the grocery store! Check out your local farmers market for locally sourced honey. Hi Patty - how nice that you have this local tie to beekeeping. And so glad you enjoyed the post!